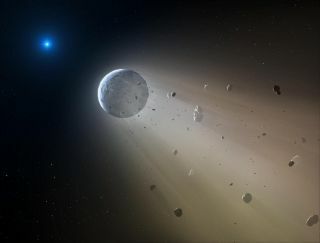 In this artist's conception, a Ceres-like asteroid is slowly disintegrating as it orbits a white dwarf star. Astronomers have spotted telltales signs of such an object using data from the Kepler K2 mission. The real-life "Death Star" that astronomers recently caught in the act of destroying a planet is continuing to disintegrate nearby orbiting objects, researchers say. This finding could shed light on how dead stars rip apart their planetary systems — a phenomenon that could happen in Earth's solar system billions of years from now, scientists added. White dwarfs are superdense, Earth-size cores of dead stars that are left behind when stars have exhausted their fuel and slough off their outer layers. Most stars, including the sun, will become white dwarfs one day. "Our sun will one day balloon out to become a red giant star, wiping out Mercury and Venus and maybe Earth, before it becomes a white dwarf," said study lead author Boris Gänsicke, an astronomer at the University of Warwick in England. "By looking at this white dwarf, we get a look at what the future of the solar system might be like." Previous research using NASA's planet-hunting Kepler spacecraft found a planetesimal transiting, or crossing in front of, the white dwarf at a distance of about 520,000 miles (837,000 kilometers) — more than twice the distance from Earth to the moon. Kepler also discovered a cometlike tail of dust trailing this object, as well as perhaps a few additional chunks orbiting the white dwarf at about the same distance, and a shroud of dust enveloping the white dwarf. Scientists previously estimated that the amount of material seen circling the white dwarf was about equal to that contained by the 590-mile-wide (950 km) dwarf planet Ceres, the largest object in the main asteroid belt between Mars and Jupiter. They suggested that the white dwarf was ripping apart the planetary bodyafter it had spiraled too close to the dead star, and that the rock would be fully destroyed within about a million years. Now Gänsicke and his colleagues find that this white dwarf system has rapidly evolved just months since its discovery. "It's exciting and unexpected that we can see this kind of dramatic change on human timescales," Gänsicke told Space.com. The astronomers used the Thai National Telescope to observe the white dwarf about seven months after previous work detected the system of rocks and dust around it. Instead of detecting strong evidence of just one body around the white dwarf, "we identified six, but there are clearly more — it could be 10, maybe 15," Gänsicke said. These bodies are orbiting the dead star at about the same distance as the planetesimal that previous research spotted, and are each two to four times the size of the white dwarf. The researchers suggest that these bodies are not giant, solid rocks, but instead are huge clouds of gas and dust flowing from much smaller rocks that are now disintegrating. "The average amount of light blocked by material around the white dwarf has gone up from 1 percent or a fraction of a percent up to 10 or 11 percent," Gänsicke said. "We interpret that as many more fragments of a planetesimal breaking apart." Gänsicke and his colleagues plan on researching this white dwarf system further. "We can see how things evolve over time," Gänsicke said. "How does the disintegration of a planetesimal work? How long does the whole thing last? Will we be able to see everything disappear in a year or two? How does the disk of dust around the star evolve? How will the metal content of the white dwarf change?" In the future, researchers could also hunt for similar white dwarf systems elsewhere. "Maybe we can find another one or two or 10," Gänsicke said. "If we have a sample of these systems, we can look at common properties and differences among them, to advance our knowledge about the process of planetesimal disruption as a whole. This is how science works — we've found one piece of a puzzle, and now we want to find more." The scientists detailed their findings Feb. 3 in the journal Astrophysical Journal Letters.